Have you tried creating an image gallery in WordPress just to find that the built-in functionality is lacking some important features? Yes there are several WordPress gallery plugins promising to deliver, but most of them are difficult to use and make your website very slow. Well your search for the best gallery plugin is over. 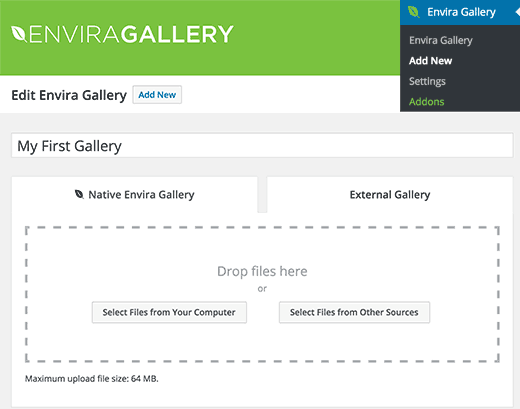 In this article, we will show you how to easily create responsive image galleries in WordPress with Envira Gallery. Why Envira Gallery is Better? If you run a photography or portfolio site with a lot of photos, then you already know the troubles that come with creating an image gallery (site speed, lack of organization, browser compatibility, device compatibility, and difficult setup). When Thomas Griffin, a well-reputed WordPress developer, announced the release of Envira Gallery, we asked for a review copy. Mainly because our clients and users often ask us for recommendations of best ways to create a WordPress gallery. As soon as we installed the plugin, we realized how easy it was to use. The second thing we noticed was the speed. Unlike other gallery plugins, Envira was extremely fast while still coming packed with features such as responsive design, lightbox and slideshow functionality, custom CSS etc. Not to mention it has other add-ons like protection which helps you protect your images, tags which help you organize all your images, deeplinking, fullscreen, supersize, and more. Now that we’ve established that Envira is indeed very good, let’s take a look at the process of creating an image gallery with Envira. Since Envira is a paid plugin, the first thing you need to do is purchase Envira Gallery. There are different plans available for different budgets and needs. Once you have purchased the plugin, you need to install and activate it. See our guide on how to install plugins in WordPress. 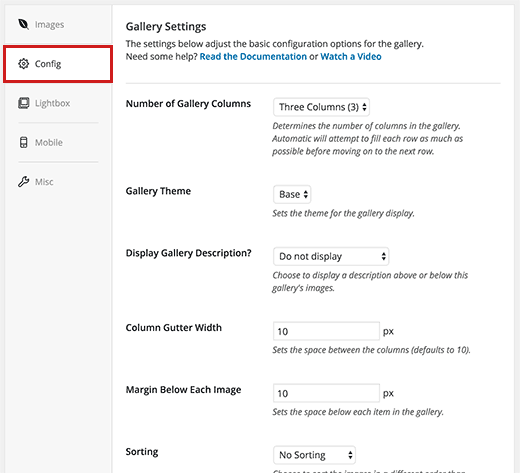 Upon activation, the plugin will add a new Envira Gallery menu item in your WordPress admin sidebar. 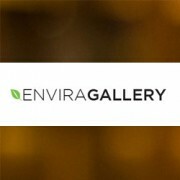 To create a new gallery, you need to go to Envira Gallery » Add New. You can upload photos or images from your computer or select them from your WordPress media Library. Once you have selected the images, you will be able to see the image thumbnails. You can rearrange images by simply dragging and dropping them in the order you want to display. You can also insert image meta data such as title and alt tag by clicking on the pencil icon on each image. Envira allows you to add HTML in the image title. You can also add a link to any page or website in the Image Hyperlink field. Once you are satisfied with the metadata, you can click on the Config tab to configure your image gallery settings. You can choose how you want to display this particular gallery. You can select columns, gallery theme, gallery lightbox theme, etc. 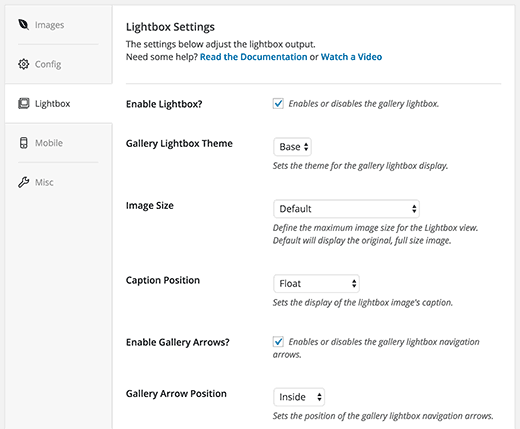 The base plugin only comes with one gallery and lightbox theme. However you can install additional themes which are available addons from the plugin website. On the Lightbox tab, you can configure settings for the lightbox used to display the full images when they’re clicked. You can choose title display, arrow display, hide or display lightbox gallery toolbar among other settings. 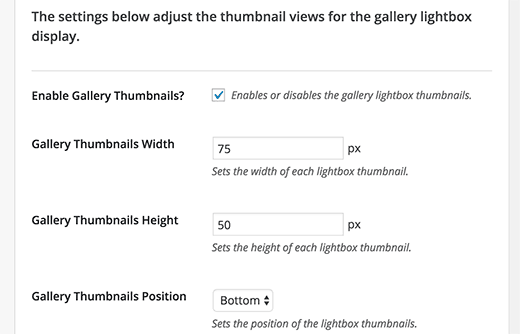 After setting up your lightbox settings, scroll down to the bottom of the lightbox tab to the thumbnails section. These thumbnails appear below the lightbox when a user clicks on an image. It allows users to browse the gallery by clicking on a thumbnail image. Once you are satisfied with your gallery settings, you need to hit the Publish button to make this gallery available. After publishing, you will be able to see the shortcodes that you can insert into a post, page, or widget to display your gallery. Envira allows you to add galleries directly from your Post edit screen. Simply create a new post/page or edit an exiting one. You will notice a new ‘Add Gallery’ button above the post editor. 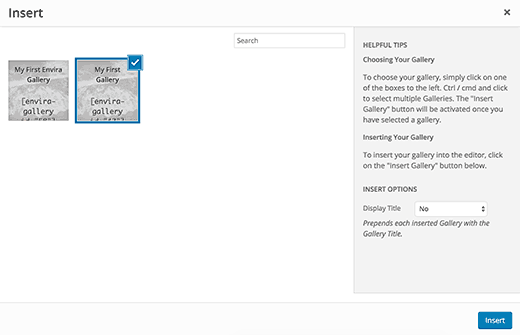 This will bring up a popup showing the galleries you have created with Envira Gallery. Select the gallery you want to add and then click on Insert button. You will notice the Envira Gallery shortcode appear in the post editor. You can now save or publish your post. Visit your website to see your responsive WordPress gallery in action. Depending on your licensing plan, Envira Gallery also comes with additional addons that you can install to extend the functionality. There are 30 addons available at the time of writing this article. We hope that this article helped you create responsive image galleries in WordPress with Envira. For questions and feedback you can find us on Twitter or you can leave a comment below. An Envira tech person got back to me, and I had to disable Essential Grid to make it work in the Highend Theme. I tried a gallery and it was easy to create, but with some long and some short captions, it didn’t look very good. Lightbox didn’t work, either, even when I disabled my theme’s lightbox. Then I tried disabling Envira, and my theme’s lightbox won’t work. 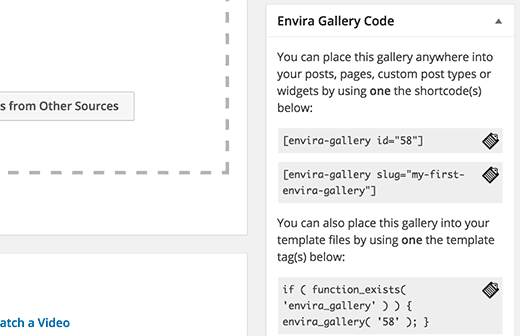 Envira uses shortcodes to display galleries. You have to add these shortcodes to display galleries and you can remove them by simply editing the post and page and removing the shortcode. Hope this helps. thanks to Envira for the gallery option. Save a lot of time. I love the Envira Plugin, but I can’t figure out how to have the gallery images link to the attachment page/post – it just links to the image, which is great if using lightbox (which I don’t want to do)…any ideas? I have been using theme “Being Hueman” on my blog but images are cut off. you can visit my blog and see yourself. I am not able to fix it and moreover, I have not seen any help on google so I have to write this comment to seek your help. 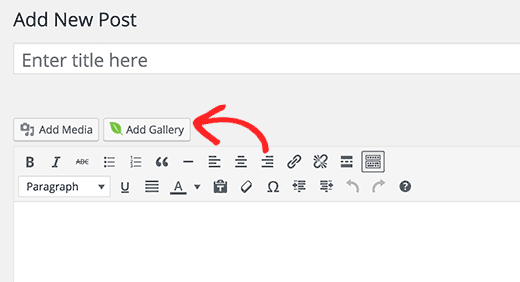 Please see our tutorial on how to crop and edit post thumbnails in WordPress. Shortcodes are not enabled by default for widgets. To enable shortcodes in widgets please add this code in your site’s functions.php file or a site-specific plugin. Envira Gallery works on any standard compliant WordPress theme. It is not an eCommerce plugin itself, but it works with most popular eCommerce plugins and themes. Hi! I’m creating a site for an art gallery. I would like to use the Envira plug in. Can you recommend a good theme to use or purchase that would go well with the Envira plug in? And at some point I would like to add ecommerce, does Envira support that or is that a theme issue? Hello. I’m trying the Envira Lite right now. The design is perfect and the program is very easy to use. However, I’m facing two problems. Firstly, my photos are taking too long to load. Secondly, even after the page is completely loaded, a kind of loading icon under my gallery continues to appear. I’d like a little help from you guys. Just bought the plugin but never saw a place to enter the code for the 20% off. Not a big deal for sure with all of the AMAZING value you provide, and QUITE possibly user error on my behalf being so eager to get it downloaded and working, but heads-up. I tried the lite version and i added photos and used the short code for my gallery. Now, I get a loading wheel and the photos don;t load. Its working fine on our side, we can see your gallery and photos. Seems like you resolved the issue you were having. Does this one have those options? It allows you to enable Tags using the tags addon. 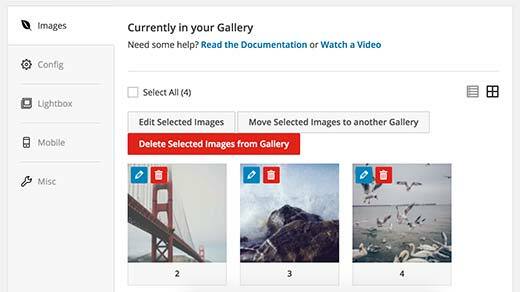 Using this feature you can allow users to sort gallery into tags. For the time being, there is no social sharing on the images.